Caesar Salad Video Slot Guide & Review - Casino Answers! Caesar Salad is a 5-reel, 25-line video slot developed by Cryptologic, featuring a wild symbol, scatter wins, multipliers and a free spins feature. You can play the Caesar Salad video slot at [Americans: Unfortunately due to legal restrictions you are unable to play at any of the online casinos this game is at. We recommend you trying playing the unique slots at Win A Day Casino instead.]. Bets on the Caesar Salad slot machine are $0.01, $0.02, $0.03, $0.04, $0.05, $0.10, $0.15, $0.20, $0.25, $0.50, $0.75, $1, $2, $3, $4, $5, $6, $7, $8, $9 and $10 per line. 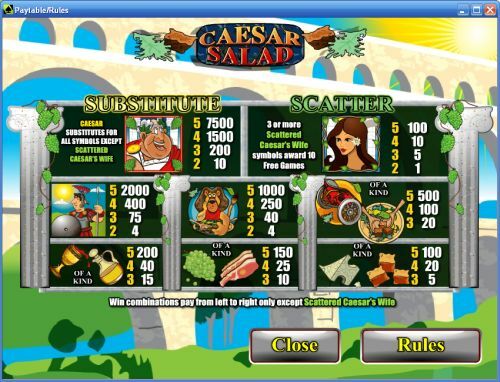 You can select from 1-25 lines per spin on the Caesar Salad slot game. You can bet as little as a penny on the Caesar Salad penny slot game up to the maximum total bet of $250 per spin. Both casual players and high rollers can enjoy Caesar Salad thanks to this betting range. You can modify the game speed from Normal to Fast or Very Fast speeds. 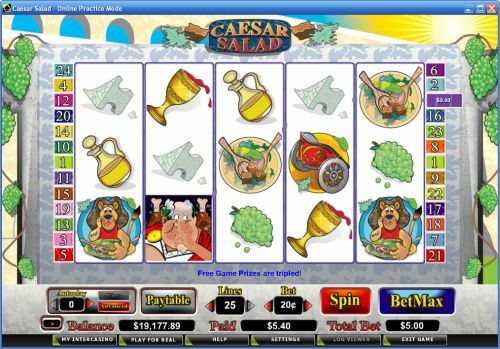 To play Caesar Salad, select your bet and press the “Spin” button or use “Bet Max” to play all 25 lines. The highest paying symbol on the Caesar Salad symbol is the Caesar Salad symbol. 5 Caesar symbols on a payline will win you the 7500 coin top jackpot. It will also substitute for all other symbols in Caesar Salad except for the Scattered Caesar’s Wife symbol. Other high paying symbols on the Caesar Salad video slot include the Centurion Guard (2000 coins) and the Lion (1000 coins) symbols. Hit these jackpots on Caesar Salad and win big at [Americans: Unfortunately due to legal restrictions you are unable to play at any of the online casinos this game is at. We recommend you trying playing the unique slots at Win A Day Casino instead.]! Caesar Salad’s scatter symbol is the Caesar’s Wife symbol, which can pay from 1X for two symbols up to 100X your total bet for 5 scatter symbols. If you hit 3 or more Scattered Caesar’s Wife symbols anywhere on the reels of Caesar Salad, you will win 10 free spins with a 3X multiplier. All winnings in the free spins feature will be tripled. The free spins feature can be re-triggered. You can select up to 999 autoplay spins on the Caesar Salad slot game. You can hit the “Advanced” button to set the advanced settings, such as cumulative win/loss of up to $5,000 or a single win of up to $5,000. You can stop the autoplay mode on Caesar Salad at any time. Caesar Salad doesn’t have much dressing when it comes to special features, but there are some nice ingredients such as the free spins feature with tripled prizes and the top payout of 7500X. You can play the Caesar Salad video slot when you sign up at [Americans: Unfortunately due to legal restrictions you are unable to play at any of the online casinos this game is at. We recommend you trying playing the unique slots at Win A Day Casino instead.]! Can Americans play the Caesar Salad online slot for real money? No, USA-based players cannot play the Caesar Salad slot machine for real money at Crypto online casinos. Instead, we recommend the less comical but excellent Caesar’s Empire Video Slot that can be found at Bovada.